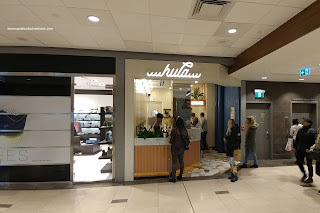 If you haven't noticed by now, I haven't even attempted to visit all the various poké shops that have been sprouting all-over-the-place in the Lower Mainland. So much like my last post on poké, new spots need to set themselves apart from the rest due to the immense competition. 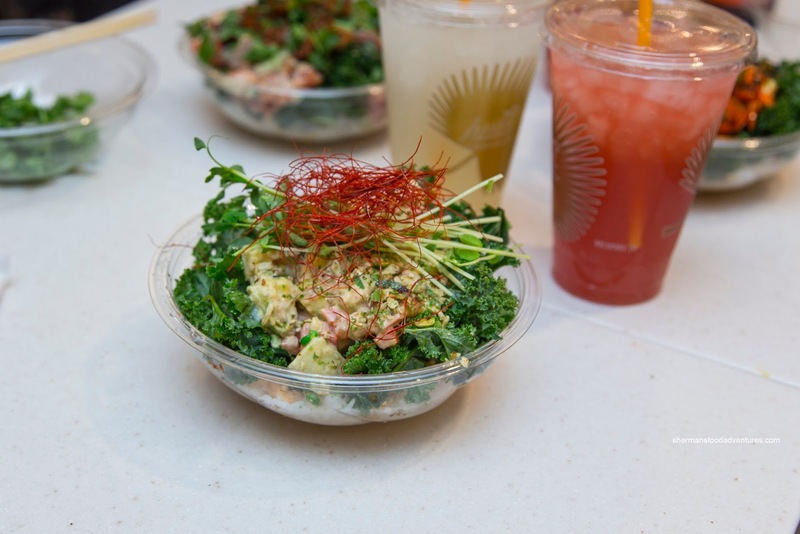 Let me get this out-of-the-way first, most of the poké in Vancity is not really poké at all (the one at Carp is pretty close to the real thing). 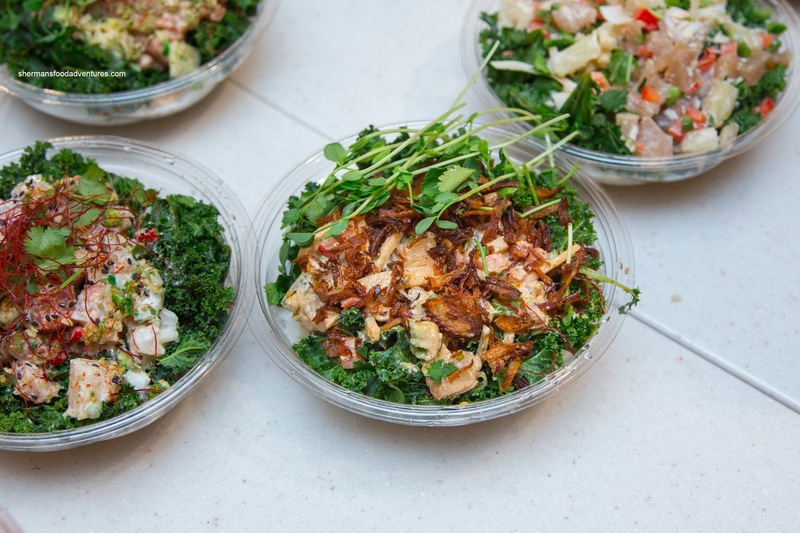 Rather, the ones we get here are more like salad bowls with rice and fish. That's not necessarily a bad thing as they can be tasty, it is more of an observation. 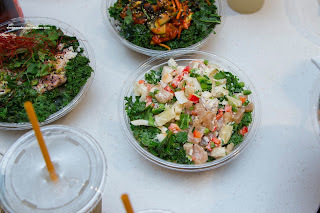 I was recently invited to sample the bowls at the newly-opened Hula Poké in the food court at Pacific Centre. Right there, the location sets them apart since it is in a food court and a busy one at that. Onto the bowls, we started with the Lei (Togarashi Salmon) and Nikkei (Citrus Ahi Tuna). At first glance, they looked similar with red pepper strings on top, but they were very different. 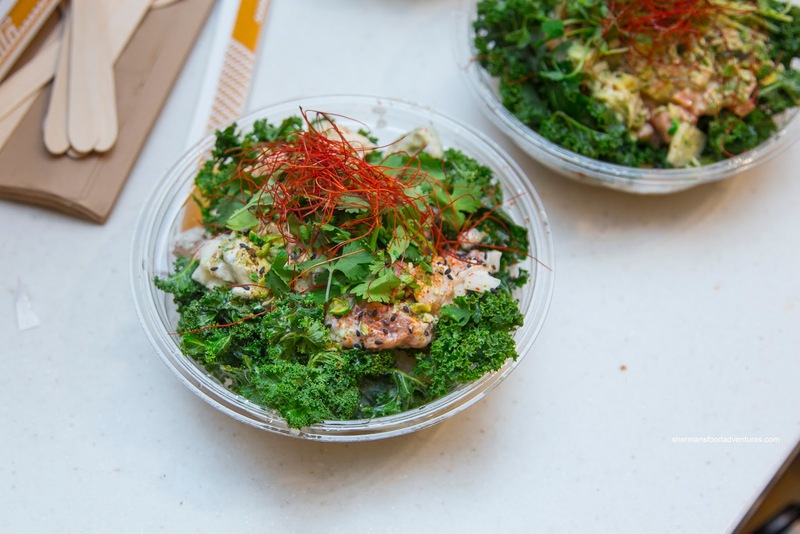 The Lei featured salmon, togarashi mayo, cucumber, avocado, red pepper, green onion, spicy peas, furikake, kale and rice. This was creamy with some spice from the togarashi. Texturally, there was crunch from the cukes and red pepper. 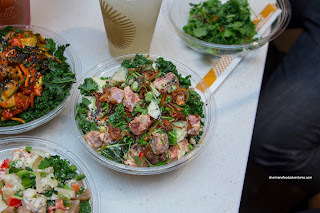 As for the Nikkei, it consisted of ahi tuna, Peruvian citrus, avocado, white onion, red Thai chili, grapefruit, togarashi, crunchy peas, black sesame seeds, cilantro, wasabi lemon crema, kale and rice. As expected, the citrus kept things fresh and light. The acidity was impactful as well as the spice. Texturally, there was variation with the soft tuna and crunchy onions and peas. Although it looked like a garnish, the sesame seeds were nutty and aromatic. Underneath, the rice was a blend of basmati and jasmine rather than the usual sushi rice. This was intentional as sushi rice can be rather heavy. With that being said, I wouldn't mind having the option of rice. As you can see, or not see, the garnishes on top pretty much obscure everything else underneath. Hence, we started to move them out of the way starting with the Koko. Besides, the amount of cilantro was a bit much in my opinion (but that can be altered of course). Consisting of spicy gochujang salmon, the koko ate much heartier with a sweet spiciness. Add in carrots, white onion, cucumber and kimichi and we got some serious texture and even more tangy spice. 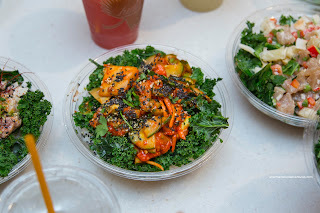 Rounding off the ingredients, we found black sesame seeds, avocado, furikake, cilantro, kale and miso ginger vinaigrette. There was a lot going on in this bowl, but ultimately, the dominant flavours were the kimchi and gochujang. Moving along, the Bahamian (Coconut Rockfish) was a complete 180 from the Koko. This was made up of rockfish, coconut & pineapple salsa, edamame, red pepper, green onion, jalapeno, coconut flakes, cilantro, kale and rice. I wasn't sure what to make of this one as the flavour profile appeared to be tropical in a Caribbean-manner. One bite and yes, the aromatics from the coconut and sweet pineapple elicited memories of a pina colada. The creamy mayo was pretty strong with a definite spice from the jalapeno while the red pepper didn't seem to belong. I thought the firm rockfish was on point being fresh and naturally sweet. Continuing with the rockfish, I tried the Ancho featuring rockfish, ancho crema, avocado, jicama slaw, green onion, red pepper, chili oil, pea shoots,cilantro, crispy onions, kale and rice. This was a winner in my books as the flavours were remarkably different with a smoky spiciness. It was balanced though where the fish was still discernible as well as the creamy and slight sweetness of the creama. The crunch from the jicama was a good counterbalance to the softer ingredients. Also smoky and aromatic, the crispy onions helped add another layer of texture and flavour. Although it is one of their most popular bowls, I didn't get to sample the Tiki (Togarashi Spicy Tuna) until nearly the end. It was a mix of ahi tuna, togarashi mayo, cucumber, green onion, red chili, edamame, crispy onions, black sesame, hijiki, cilantro, kale and rice. Once again, they weren't shy with the spice level. That in itself was impressive as it could alienate some customers, but really, why make food bland? For the 6 of us, we all enjoyed the spiciness as well as the creamy dressing and the aromatic crispy onions. Again, the amount of cilantro was a bit much for my liking (but you can ask for less). 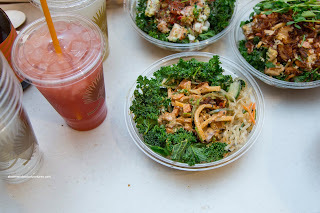 Our very last 2 bowls consisted of Cali Veg (Miso Ginger Tofu) and the Sweet Potato (Ancho Sweet Potato). Predictably light and refreshing the Cali veg featured miso ginger tofu, snow peas, red pepper, avocado, carrots, black sesame seeds, red pepper string, kale, hijiki, and picked cucumber. 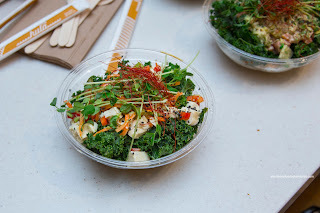 Naturally, this was less robust than the ones with fish, but at the same time, it was still filling and had the benefit of some familiar Asian flavours (like a hybrid Chinese/Japanese salad with a vinegary taste) and plenty of crunch. As for the Sweet Potato, I would actually order it. This sported sweet potato, ancho crema, jicama slaw, green onion, red pepper, chili oil, cilantro, kale and crispy onions atop noodles. This almost ate meaty with the aromatics of sesame and spice. Loved how there was a bevy of textures too. This bowl, like the others, highlighted the premise behind Hula Poke. They offer a product that is related to poke, but put their twist on it. Lots of quality and fresh ingredients that make for a quick meal that doesn't involve the fryer.